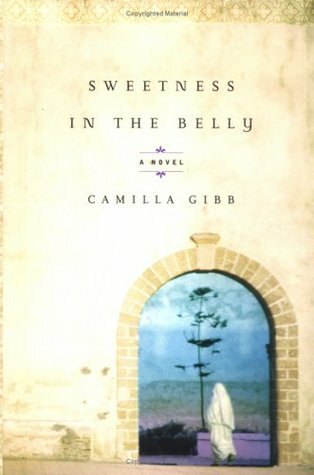 This is the first book that I have read by Camilla Gibb, and I can’t believe that I have waited so long to read it! I find this book hard to describe, because it goes back and forth in time so much, and because it is about so many different things. But I will do my best. This story starts is London, England in 1981, where Lilly is working as a nurse. No one around her can tell by looking at her that she is a Muslim immigrant from Ethiopia struggling to fit into her new life in London, because she is white. But she identifies more with all the refugees streaming into the city from Ethiopia and surrounding countries than with the other Londoners. With her friend, Amina, she establishes a community association in order to help refugees find their loved ones. While she is helping many others, she is also searching for her own loved one. And it is taking years. Every evening for weeks, Amina and several other Ethiopians who lived in the building by then crowded into my flat to watch in horror as a parade of bodies on the verge of crumbling into dust crawled across the screen. We were sickened with ourselves for being riveted by the spectacle of this death march. We were ashes-to-ashes fascinated by this movement, heaven-bound invariably, for there is no hell anymore when it has arrived here on earth. Then the story takes us back to when Lilly first arrived in Harar, Ethiopia in 1970. She came to live with a peasant woman, named Nouria, and her four children. Being white, she struggled at first to fit in, but she gradually began to prove her worth to Nouria and some of the others in the community. Through the disturbing circumcision ceremony of Nouria’s little girls, Lilly meets and becomes friends with a young doctor at the hospital, Aziz. Aziz opens her eyes to new ideas and to love. Lilly is young and has never been in love before. She is infatuated but also confused about what is right and wrong in her beliefs, being a strongly religious girl. She has been taught that you “must never be alone with a man, because the devil will be your third companion”. Whenever I tried to meditate beyond the page these days, though, an image of Dr. Aziz came to mind. Of his brown eyes made clear in sunlight. Of the uncertain corner of his mouth. Then the bees would awaken, rush into my throat and dance on the tip of my tongue, depositing pollen between my teeth, making it difficult to recite anything at all. Nothing in my life up to that point – not grief, not illness, not dislocation – had ever interrupted my religious practice. But then no one had ever challenged it. This is why the Sufis try to erase the body, I realized in that moment. Not because it is a host for parasites, not because it demands food and water and sleep, but because one mouth to one finger can override the most sacred sentiment, the most pious intention. One mouth to one finger can lead to a kiss and that kiss can change the world. Since the first day that Aziz had held my hand, I’d been discovering that nothing was quite as it first appeared. But then, this is where we begin in every new world: first we read the manual. We practice the laws as they are laid out, and it is only when we become literate through living them that we find the contradictions, the subtext, the spaces in between. There were signs everywhere: evidence of a current flowing beneath the strict rules of engagement that governed the relationships between men and women. People were not supposed to marry for love, they were supposed to marry to secure alliances between families: for lineage, for wealth, for status. And darkness like Aziz’s offered none of those things. Hararis turned away from the dark even when it ran in their own blood: they preferred to look east, not to Africa, for their origins. They preferred to think of Arabs – the profit and his companions, the saints – as their ancestors, rather than slaves. It was a fiction that was comlicated by dark skin. In London, Lilly does her best to live her life, but really she has put it on hold. She has lived alone in her bare little apartment for more than 15 years and still has nothing on the walls. When a Doctor from the hospital takes an interest in her, she tries to avoid him. Amina is her only friend, and she spends every Saturday at the community association scanning the ever-increasing lists of names. …I see a country being turned upside down and all the people being shaken out and deposited into the camps that straddle Ethiopia’s borders like a ring of fire. The majority will die there, forty miles from the borders of home, of starvation and disease, the newest epidemic of which is AIDS. SPOILER ALERT! It’s only when Lilly gets the information she has been waiting for that she can move on with her life. This is what the world looks like now: a veiled Ethiopian woman skiing down the side of a Canadian mountain. The picture of resilience. The new world. I loved this book, and even though I’ve just written almost the whole book out for you (in a rambling kind of way-sorry), I still recommend that everyone read it! 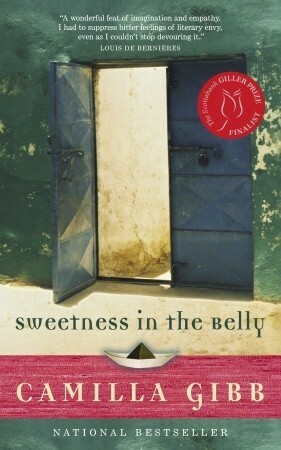 Sweetness in the Belly is one of the Canada Reads Top 40 selections for 2014. You are reading some very interesting books. I liked the different book covers too. Do you have a favourite? I think the second one is my favourite. In my opinion, it best represents the book. The characters are fictional, but it’s based on true events. It really is so good! I’m always interested in reading immigrant stories, and it would be interesting to read one involving these countries. I also love the book covers. I learned so much about the unrest in Ethiopia that happened when I was too young to pay close attention to what was going on. But I do remember Ethiopia was a country everyone talked about. 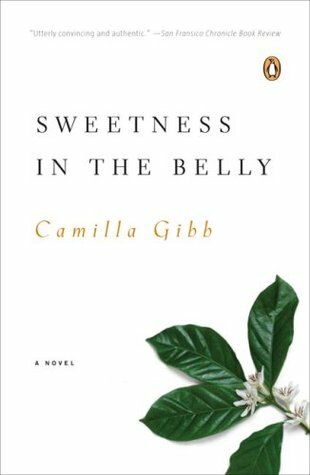 I love Camilla Gibb and I loved this book. Such a clear and compelling voice. I loved it too. Have you read her other books? I find this description and these quotes very compelling. I appreciate any novel that challenges people living life by rote. Thank yo for a very well written review. I will put it on my list. If you get a chance to read this book, I really think you will like it. This one will stay with me for a while. That is always a good sign–those stories that resonate and live inside us long after we have turned the last page. I felt the same way when I read this last year: why did I wait so long?! Have you read any others by her? I am tempted. I wasn’t really aware of her until I read this book. She have anything recent? She had one published in 2010 called The Beauty of Humanity Movement, but I haven’t heard anything about it except what I’ve read on Goodreads. It has good reviews on Goodreads, though. This event sounds wonderful! Thanks for letting us know!